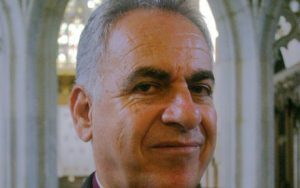 Before considering the role of churches in interfaith dialogue, it is important to note the key role played by religion in the communities and societies of our region, said he Anglican Archbishop in Jerusalem, the Most Revd Suheil Dawani, at the Carter Centre in Atlanta, Georgia, USA. Jerusalem – and the Middle East more generally – is a place where religion is integral to the identity of individuals, families, communities and national societies. Thank you esteemed Chair for the invitation to speak at this conference, and for all the Heads of Churches and other delegates that have travelled to Atlanta for this important meeting. Thank you to the Palestinian Authority for convening this meeting, which I pray will have a deep significance for the faith communities in our region, and for wider society. I bring greetings from the Holy City of Jerusalem and from the Anglican Community in Palestine, Israel, Jordan, Syria and Lebanon. Before considering the role of churches in interfaith dialogue, it is important to note the key role played by religion in the communities and societies of our region. Jerusalem – and the Middle East more generally – is a place where religion is integral to the identity of individuals, families, communities and national societies. In the secular West, religion is seen as ‘optional’ and ‘personal attribute’; as part of individualism. In our context, in the Middle East, religion is an attribute that is central to identity, to relationships, and to the choices we make as individuals, families, communities and nations. I do not believe this is always recognised or understood in the West, but it is both an integral and part and parcel of our experience. It is also central to the role of the churches when addressing issues of justice, peace and reconciliation in a multi-faith context, where religion is often part of the problem and yet I believe an essential element of the solution. Jerusalem is both the focus of our concerns, as well as a test case for interfaith dialogue and cooperation for the common good. The vocation of Jerusalem is to be a city of peace. Its very name invites us to explore diversity and peace within the one shared reality. In the first instance, as is well known, the salem element in the name of our city refers to the words for peace in both Hebrew and Arabic: Shalom and Salaam. On the other hand, the dual form of the word in Hebrew suggests some kind of plurality about this place of peace. 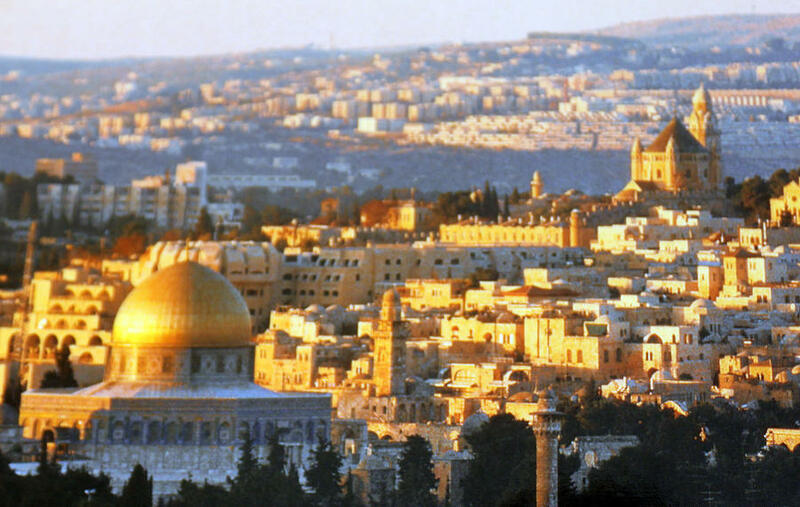 The very form of the word invites us to imagine Jerusalem as more than a simple reality, but rather a place where a rich diversity is integral to the Shalom/Salaam found within its walls. Please keep this idea in mind as we later return to the theme of multi-faith dynamics and interfaith dialogue as a pathway to peace. The religious diversity of Jerusalem is apparent even to the casual observer, and sometimes the diversity leads to conflict that shames every person of faith. To begin with my own Christian tradition, there are three families represented within the official Christian community in the Holy Land: The Orthodox family; the Catholic family; and the Evangelical/ Protestant family. This diversity among Christian is matched by diversity among our Jewish and Muslim neighbours. The Jewish community itself is very diverse, reflecting the origins of many of the Jewish immigrants in different settings across Europe and the Middle East. The formal duality expressed in the appointment of two Chief Rabbis, one Ashkenazi and the other Sephardic, barely hints at the diversity among secular Jews, traditional Jews, Conservative Jews, Orthodox Jews, and Ultraorthodox Jews, not to mention Reform Jews or many individual schools within these major streams. The Islamic community is also characterised by considerable diversity. While the majority of Muslims in Israel and Palestine are Sunni, there is huge diversity between different mosques and between the Muslim religious leaders. Our religious diversity, and the competition it often breeds, has too frequently been part of the problem in our region. However, that very diversity may also be an asset as we seek to deepen trust and reduce violence. In addressing the topic of the role of the churches in interfaith dialogue, I want to propose that the essential role of the churches is develop, embrace and practice a theology of presence as a form of mission in our complex social and political context. Such a theology will not ignore witness and evangelism or turn away people drawn to Christianity from other religious communities. But it will understand that proactive evangelism is problematic and perhaps even unhelpful in our context. We can begin to conceive a new theology of Christian presence by asking the question: What is the mission of Christ in this land at this time? Let me suggest seven reflections for the mission of Christ in Jerusalem and the Middle East today, and then give some examples of what this looks like on the ground. Faith – in the first instance, the Church is called to be a community of people who are responding to the call of God upon our lives. Like Mary, the young Palestinian Jewish maiden from Nazareth, God call us to respond with our own yes to the divine invitation to be bearers of Christ in our community, and in our time. Without that deeply personal response of trust and commitment to God’s plan for our lives, there can be no mission of presence among our neighbours. Once we have said yes to God, then everything is possible. Hope – as a community of faith, we operate from love, not fear. Rather than responding out of fear, we act out of love. We are inspired by hope. We believe that God has good things yet to be revealed and claimed by humanity, and especially within our context in the Middle East. And so we refuse to be overwhelmed by complexity and negativity. As a community that brings Christ to birth once more in our time, we are people of hope. Hospitality – taking a lead from our understanding of God as essentially Trinitarian, we are a people who exist for others. As Arab Christians – as Christians who came to know Christ at the first Pentecost – hospitality is an ancient virtue that is deeply rooted in our culture and our psyche. We welcome the stranger. We give sanctuary to the refugee. We receive the pilgrim who has come from far away. Diaspora Jews who seek to make a new home here among us. This has its own challenges for us, and especially when the newcomer seeks to take over our land and evict us from our homes. But even then we must not betray our own best principles by choosing fear over love. We have always tried to live in community with those who are different to us. Service – as the people of God we shall spend ourselves in service to those in need. A Christian theology of presence will be expressed in our hospitals and schools, in our clinics and our community centres. We shall offer water to the thirsty, food to the hungry, and visit those who are ill or in prison. Our service is not limited to those who share our faith or our national identity. We walk the extra mile, and we pray for those who persecute us – even those who steal our land and desecrate our churches. We do this, not because it is easy or something that comes naturally to us; but because it is the work of God in the world. Solidarity – one of the ways that we serve is through our solidarity with the dispossessed and the marginalised. As people of faith we do not pretend that evil things are not happening in our land, or that deep injustices have not been perpetrated against our people. We reject violence as a form of resistance or a pathway to justice. But we stand in eternal solidarity with the victims of discrimination, ethnic cleansing, racism, tribal violence, and war. “How long, Lord?” How long before justice comes? How long before your kingdom arrives? How long before your will is done on earth as it is in heaven? Prophets – like God’s prophets in every age we are called to speak truth to power. The biblical prophets were not fortune tellers. They revealed the consequences of the choices made by people and their leaders. They foresaw the tragedy of personal and collective collapse. They glimpsed a better time in the future. But most of all they spoke God’s truth to men of power, and they spoke God’s truth to the mob that could not see beyond the immediate moment with its temporary satisfactions. As people engaged in the mission of divine presence in our conflicted region and our divided city, we call on leaders and their followers to make better choices. To choose what makes for peace, and to protect the vulnerable among us. Justice – as a community we seek to act justly and walk humbly with our God. We seek to promote justice for everyone. We are not seeking privileges or protection for our own communities. That is a trap which has brought devastation to various religious communities in our region. Everyone loses when one group is privileged. Even the privileged group loses in the end. Justice redresses wrongs and builds hope for a better future. Without justice there can be no reconciliation, no peace, and no future. So we stand with the victims of injustice, we invoke the legal instruments – whether national laws or international covenants – designed to establish justice, and we denounce acts of injustice irrespective of the identity of the perpetrator. These seven suggestions are some essential attributes of a Christian community that embraces a theology of divine presence. You may have already noticed that none of them are exclusively Christian attributes, even though they are authentic Christian attributes. Herein lies perhaps our major task as a Christian community engaged in interfaith dialogue. When we are true to our own deepest calling, we are close to the deepest calling of our interfaith colleagues. In being who God calls us to be, we encourage and support people of other faiths also to be what God calls them to be. If every religious community in Jerusalem and the Middle East practiced these seven attributes then our region would be a more peaceful place, and perhaps even a model of justice and reconciliation for other parts of the world. Let me conclude by offering some examples, drawn from the life of the Anglican Church in Jerusalem and the Middle East, of how such a theology of presence looks in real life; and how this theology of presence can foster peace between the diverse communities in our land. No doubt similar examples could be found in Jewish and Muslim contexts, but these are examples drawn from the life of my own small Christian community. Princess Basma Centre, East Jerusalem – this institution, which the Anglican Church, runs provides support for disabled children and their parents and grandparents, and provides a fully ‘inclusive’ school. Its service is for all. Al Ahli Arab Hospital, Gaza – we only have one Anglican in Gaza, yet our church offers thousands of Gazans excellent hospital care at minimal to nil cost. Theodore Schneller School, Amman, Jordan – this institution provides care for orphans, for refugees and for children. It runs a school from kindergarten upwards including a vocational school and Guest House. Again this is a service for all, irrespective of what religion they are. St Luke’s Hospital, Nablus – this hospital in the heart of the West Bank provides an essential service for the community. Recently it treated a young man with a bullet in his back, free of charge. In the best moments, each of these institutions and many others beside them, give glory to God and serve our neighbours in their moments of need. They do not compete with others or seek to draw people away from their own communities of faith. They are simply expressions of Christian presence, and as such they are signs of God’s presence with us all. They address suffering and build hope. They are signs of God’s kingdom and God’s peace. They are bridges of compassion between different religions and diverse communities.